Some risk-taking traders pounced on a very short-term market bet and levered their returns via an all or nothing options trade expiring in just a single day. 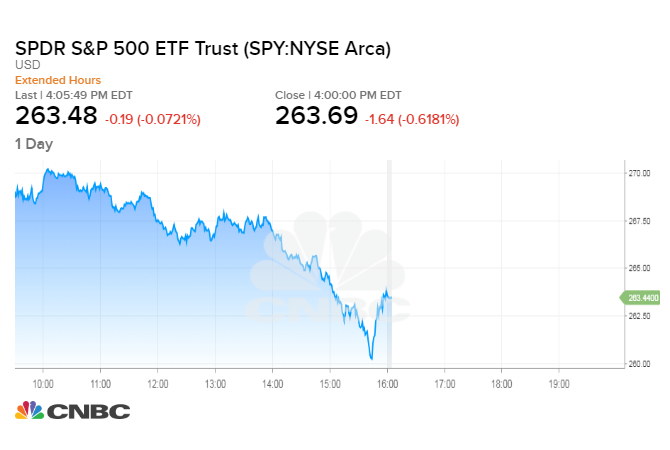 On Monday morning, as the SPDR S&P 500 ETF (SPY) was trading at $270.25 just 30 minutes into the session, someone began buying the 267 puts for 25 cents expiring Monday at the close. The bettors were paid handsomely, as these puts exploded to a high of $7.06 as the SPY fell to $260 in the final half hour of trade. More than 43,000 of these 267 put contracts traded on Monday, which at the high of the day represented $30,358,000 in value, in a single session. A long shot bet on the Baltimore Orioles winning next year's World Series just posted at 350:1, but this bet paid off 35 times your money in just five-and-a-half hours. Jon Najarian is a CNBC contributor and co-founder of Investitute.com.